What were Friedrich Nietzsche’s views on religion? In Beyond Good and Evil (1886), The Genealogy of Morals (1887), and The Anti-Christ (1888), Nietzsche described Christianity as a sickly ethics of weak people’s resentment of the strong. He thought that before Christianity “blond beasts” had become masters of their subjects through daring acts of ferocity. That ancient ruling class was naturally cruel to those not as strong. These fierce rulers saw their weak subjects as “base,” while their own traits of pride, courage, reverence for tradition, and loyalty to one another constituted their virtues. The old aristocratic system of values was in time destroyed through the machinations of a priestly class, which denied itself by turning its cruelty inward, and encouraged the oppressed masses to identify what hurt them as morally bad—evil. One has to test oneself to see that one is destined for independence and command—and do it at the right time. One should not dodge one’s tests, though they may be the most dangerous game one can play and are tests that are taken in the end before no witness or judge but ourselves. 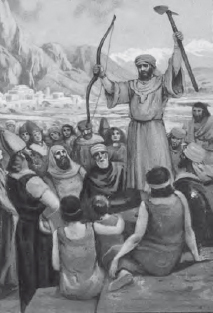 The prophet Zoroaster (or Zarathustra), who founded the ancient Persian religion, inspired Nietsche’s idea of the “Overman” (Art Archive).